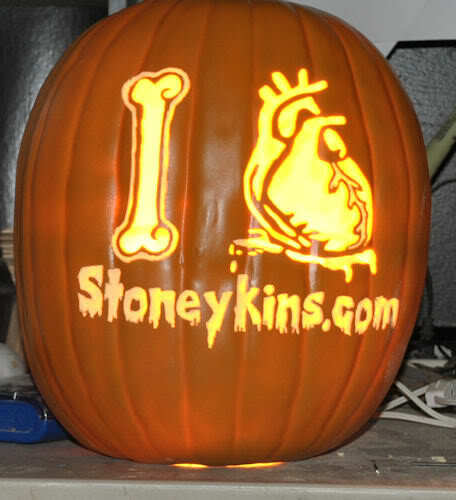 This is what we will be carving. The Tutorial is based on using full sheet Sticker Paper & X-acto Knife. 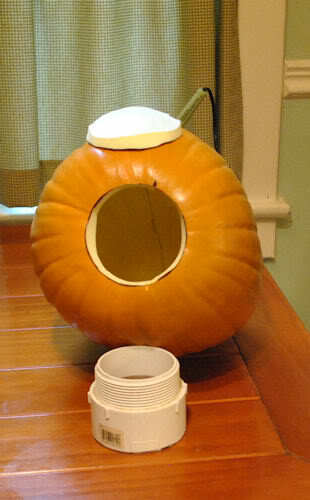 The Size of the Hole Depends on the Pumpkin - if it has Black Lines or not. 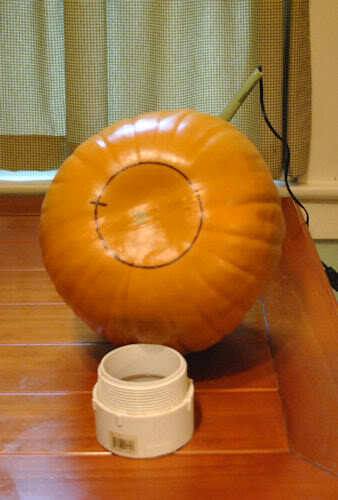 If your Pumpkin DOES Have Black Lines, You will want the Hole to be 4" Round. This is Large enough for the Paint stripper Wheel. 1) a Pencil (I will use marker just for the Tutorial so you can see the line. 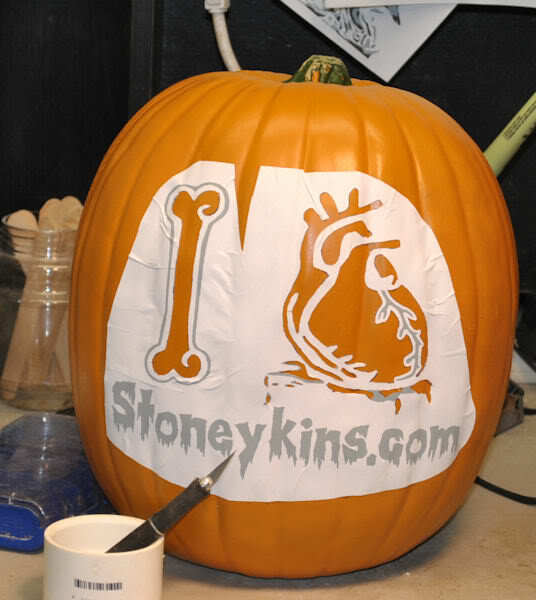 Using a Hot knife will give you a Nice Snug Fit, So you can Plug it Back when the carve is Complete. 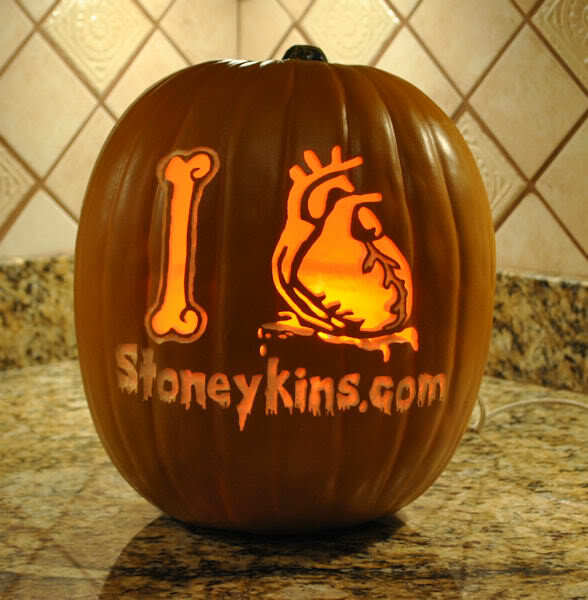 Place it on the bottom of the pumpkin and trace around it with a Pencil. 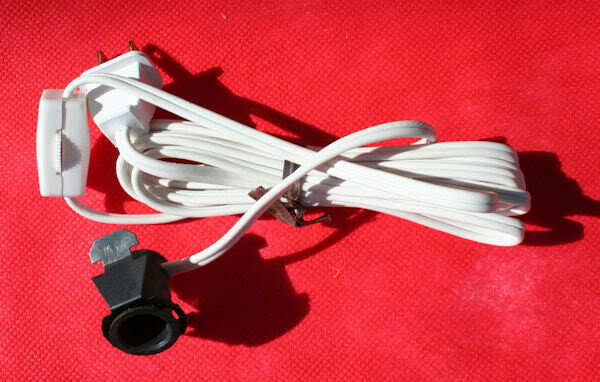 I Also Add one small Line Across the Circle, to show how to place the plug back in. I would still cut a hole in the bottom to remove Pieces you cut out and Foam Dust. But I would make the Hole 2" inches instead of 4" inches. To remove the Lines they Need to be Sanded Down. A Tip from Carver Doh: is to use a Paint Stripper Wheel with an extension Rod hooked up to a Drill. And use an Up and Down Motion, until the lines are Flush with the Rest of the Pumpkins Foam. 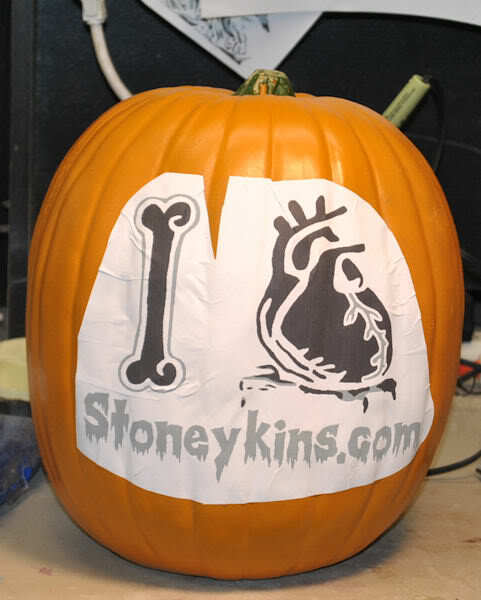 Hopfully Next Year there will be No Black lines in the Pumpkin ! 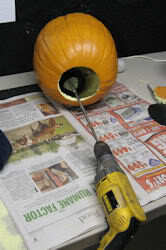 Use you finger to go down the center groove of the pumpkin. Then Work the pattern Around doing one side at a time. I still will cut some lines in the pattern , and also will make sure any wrinkles fall outside the pattern Area. You Can Also Create Folds, as long as it does not interfere with the Patterns Design . 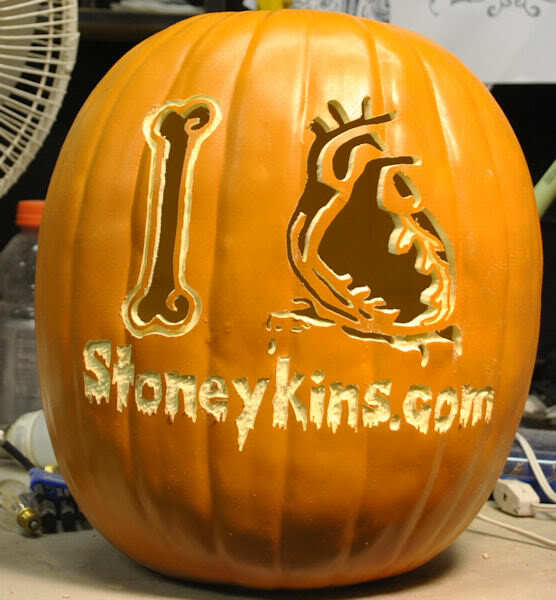 a Tip is if you make the pattern a Little Damp, it will be easier to place on the Pumpkin. BUT: You have to make sure it is completely Dry, Before Starting to work on it. It's only Damp Water So it will only take a Minute or two. If Hot and Sunny Outside place it in the sun to Dry. I normally SKIP this Step, I don't have the time you guys have to carve. So I just Cut out the Black Shapes with the Dremel. For this Tutorial - to give you the Cleanest Lines Possible. 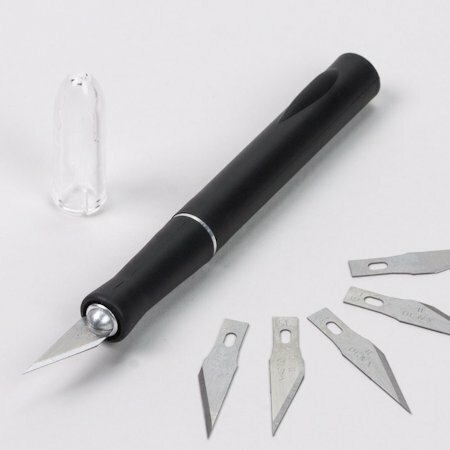 We will use an X-acto Knife. Just go Deep enough so some foam Dust Comes to the top. it has a Rubber Handel and also Has a Bump so it does not roll off the table and stab you in the leg. Make Sure the Blade is Sharp, their Cheap so replace the Blade if Dull. A Very Sharp Blade makes a HUGE Difference. Carefully go around each BLACK Shape and Remove the Sticker paper from that Shape. Keep going until you Do them ALL ! You can use the tip of the X-acto to pull the sticker up, to get it started. 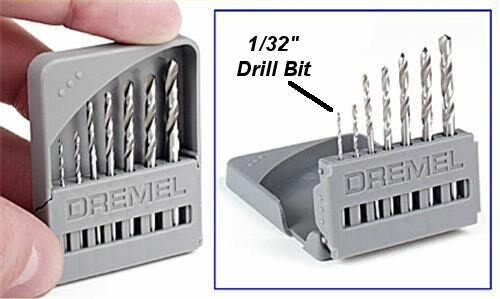 If you don't already have this Dremel Drill Bit Set, Buy One ! 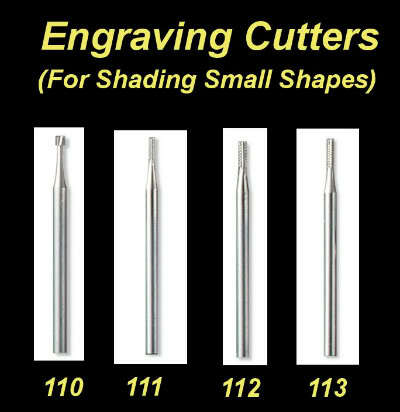 The Bit were going to use For ALL Cut-Outs is the 1/32" Bit. Now these do Break from time to time, So Make sure you buy extra 1/32 bits. The Set is good to have, You can Use them to make Windowkins in Foam Board. 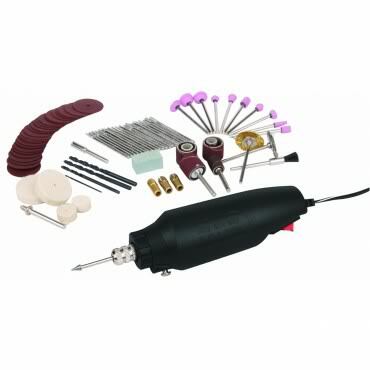 Or Using your dremel to drill Holes in things around the house. When we get to the Part I circled Were Going to Switch-up ! if I removed the two Cut-outs on both Sides of it. So Were going to Shade that NOW, then Cut-out the Two Shapes. We'll get into Shading Soon: "X-Acto First then Shade". Here's Our Pumpkin With All the Cut-out Shapes Cut. Let's Move on to Shading ! This Step is a MUST ! 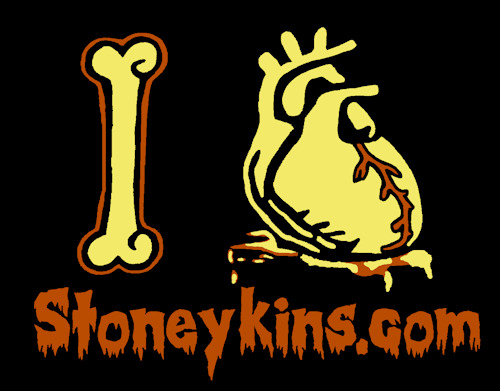 You can't Skip it, or your carve will not Look Nice & Clean. 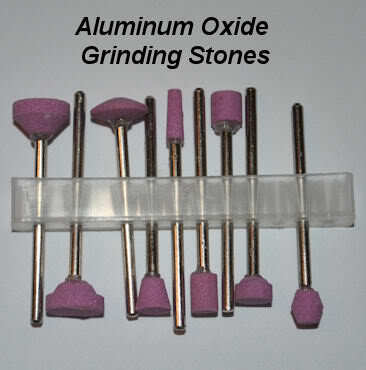 Like the Cut-Out Outlining, you can Use an X-acto or 1/32" Bit on a Dremel. Using an X-acto does take time, but you do get Better and Quicker the more you Use one. Here's Our Pumpkin with ALL Gray (Shaded) Shapes Outlined and Paper Removed. And What they are Good For. Basically I use the Same type Bits for ALL Rough Shading. Just Different Sizes Depending on the Shape that needs to be shaded. (Notice I don't say Shave - I hate that Term) It's either Shaded or Engraved ! So we'll Go with Shaded. - LOL ! 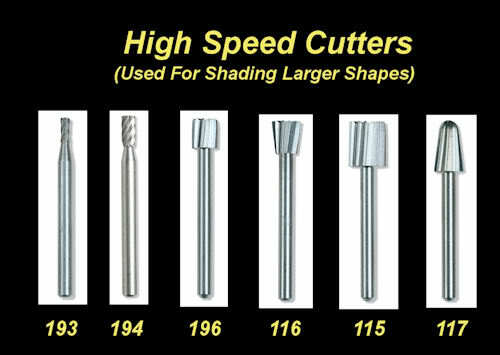 The Bits I use for Small Shapes or Lettering is these. 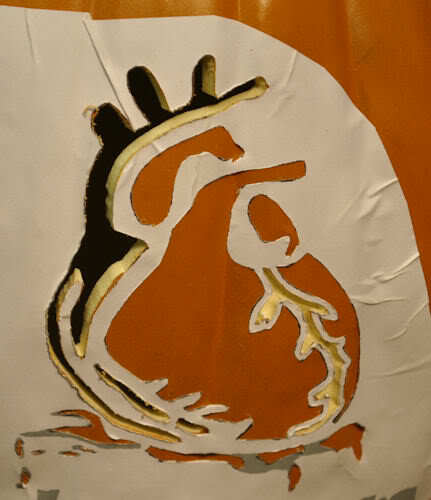 I will Also use these to Outline the Larger Shapes Once More.
. 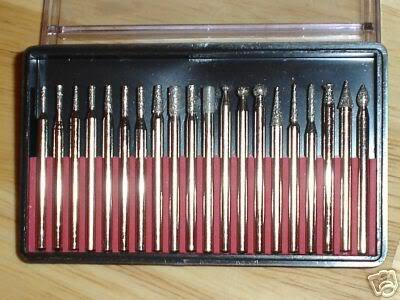 These are Dremel Brand Bits. the Bit Number is below each Bit. For Shading Larger Areas, Nothing Beats these Bits. 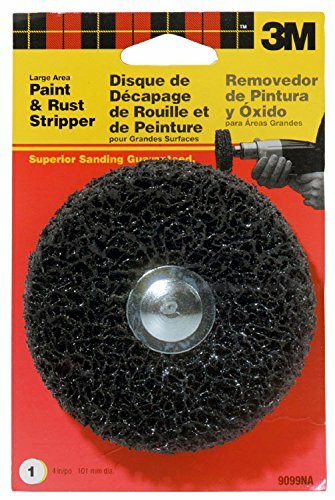 This will also Fix Your Paint Rippling Issues. 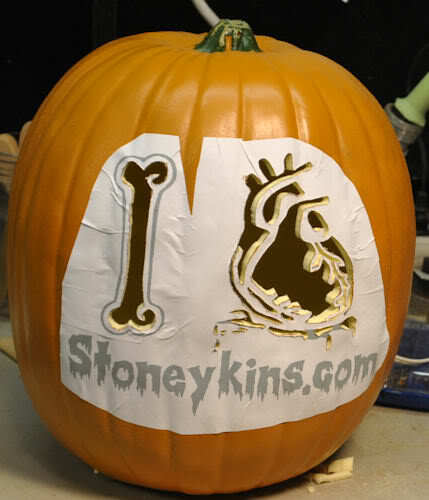 Here's the Pumpkin for Which I call Rough Shading Paint Removed, And Deep Enough ! 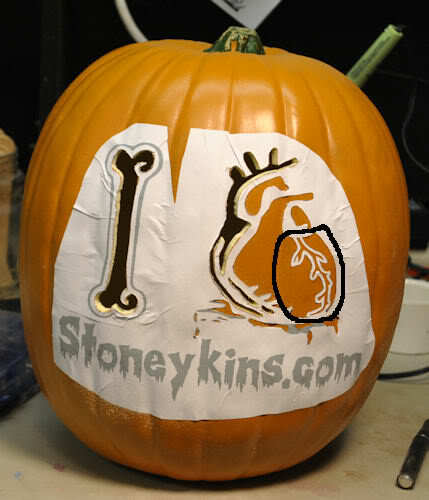 There Has been Issue with Sticker Paper removing Paint from the pumpkin, in the past few years. 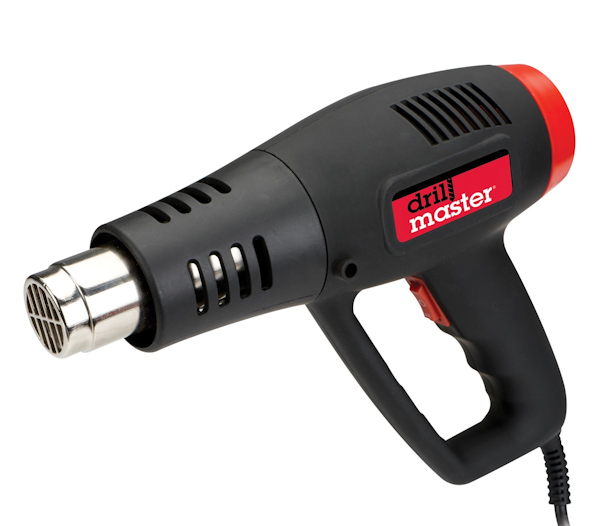 So We Recommend using a Heat Gun to warm the Stick up, while you remove it. 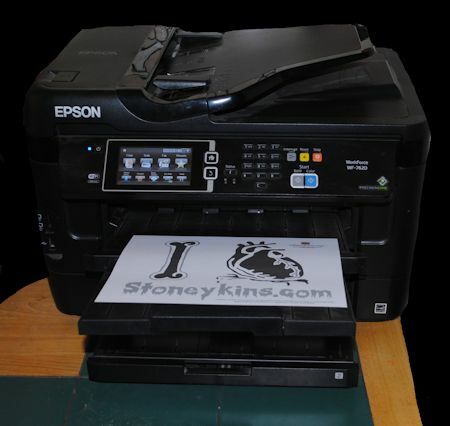 This is one of the Best Benefits on using Sticker Paper. 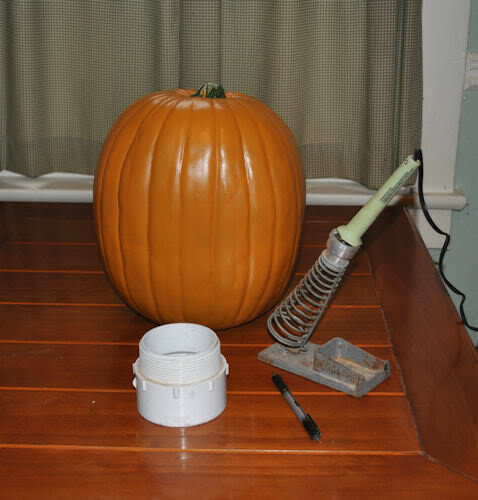 Remove the Pattern While the Pumpkin is DRY ! No more soaking in a sink, and Waiting For the Foam to Dry, to do the Clean-UP. and Smoothing out. Just Remove ALL the Paper and Toss it in a trash Can. I don't have hours to spend making it Silky Smooth. Plus I really Do like the Handmade look to it. The bulb is a Little Bright, I'll shoot it Again For the Finished Carve. After It's Cleaned in the Sink. This Is much Easier to Clean, Because of using Sticker Paper. 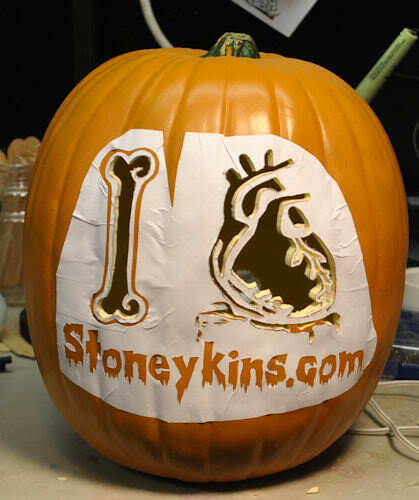 If there is some Residue Still on the Pumpkin from the Sticker Paper. Just use a SOFT Bristle Scrub Brush on it. 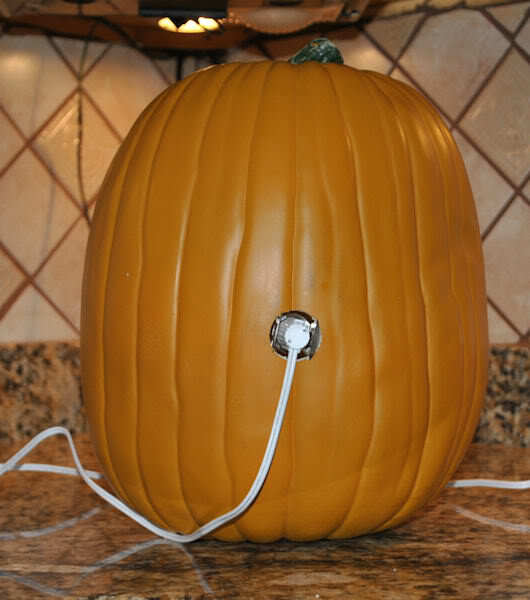 For Lighting Foam Pumpkins, I Like to use Clip In Lights. 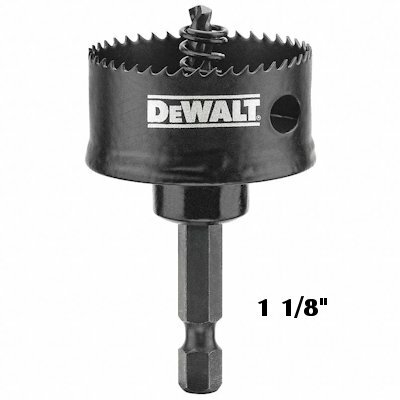 You will want to Drill the Hole Using a 1 1/8" Hole Saw. Doing it by Hand will not make a Perfect Circle. 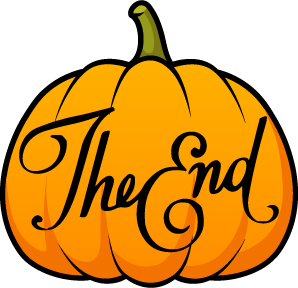 the Circle Piece you cut out of the Pumpkin.